The key difference between yakiniku and Western-style barbecue is the way the meat is presented. In the West, it’s common to barbecue large cuts of meat: a whole steak, say, or a marinated chicken breast. In Japanese barbecue, on the other hand, the beef is sliced into small, very thin slices and seasoned with a particular kind of sauce. You place each morsel on the grill, cook it, dip it in sauce, and eat it right away. That way, no single morsel spends more than a few seconds in transit between the grill and your mouth! To make this practical, Japanese barbecue is cooked over an open fire that’s built right into the center of the dining table itself. In restaurants, this tends to happen indoors, so Japanese white charcoal is a must. Regular charcoal would create too much smoke, but Japanese white charcoal burns at a lower temperature and for a longer period of time, giving the meat a special flavor. Some types of artisanal Japanese charcoal, like bincho-tan is a specialty in its own right. Yakiniku isn’t just about steak, either: we Japanese barbecue just about every type of beef imaginable. The most popular may be kalbi (“galbi” in Korean)—marinated beef short ribs—but short loin and beef tongue are also very popular. And, yes, Japanese barbecue is big on offal. Heart, intestines and all four of a cow’s stomachs—each of which has its own name in Japanese barbecue menus!—are yakiniku mainstays. But pork short ribs and pork loin are popular as well, and even wieners, which usually show up on kids’ menus. Yakiniku is Japanese cooking, after all, so you can’t forget the vegetables—a Japanese barbecue isn’t complete without sweet peppers, onions, eggplants, carrots, shitake mushrooms, sweet corn and cabbage. Grilled cabbage might sound weird, but after it’s grilled it turns mildly sweet and is really quite delicious. The sauce in any type of barbecue is what makes it come to life, and the same is true for yakiniku. Every restaurant has its own special method for making yakiniku sauce—it’s not something you’d make at home. Far from a simple salt-and-pepper seasoning job, the flavor of the sauce tends to be robust and complex, sweet and garlicky and soy-saucy all at once. It’s hard to describe the taste of yakiniku sauce if you’ve never had it, so you are strongly encouraged to try it! It’s yakiniku sauce that makes yakiniku yakiniku. Without it, yakiniku is just grilled meat. There’s just one exception: beef tongue. A lot of Westerners shy away from tongue—the idea just isn’t that appetizing—but on a typical yakiniku menu, tongue is the most sought-after, expensive item. The taste of tongue is so delicate that it doesn’t need much seasoning; Japanese people prefer to serve it simply, with salt and lemon, rather than overpowering it with yakiniku sauce. The truth is, yakiniku doesn’t have very deep roots in Japan. Throughout most of our history, Japanese didn’t eat much beef. It’s not that we were vegetarians; wild deer and boar were always on the menu. Although eating game was accepted, eating farm-raised animals was considered deeply immoral until the middle of 19th century. It’s only since the 1930s that people finally started to appreciate eating beef in Japan. So how far back can we trace yakiniku-style barbecue? There are many different theories and no single one is generally accepted. At yakiniku restaurants, you usually find Korean side dishes such as kimchi, namul, bibimbap and naengmyeon. Perhaps for that reason, many people, even in Japan, believe yakiniku is really a Korean thing. Others dispute that, because some parts of the yakiniku experience don’t exist in Korea. For example, eating offal and using a dipping sauce after grilling are unique to Japan. Some believe that Koreans living in Japan started to sell grilled offal at barbecue shops during the post-war famine years, and that after that, it “became traditional,” which would suggest that yakiniku has Korean roots after all. But using a dipping sauce after grilling the meat is unheard of in Korea—and some say it was invented by a restaurateur in Osaka, Japan. Whether yakiniku is Korean or Korean-inspired, it’s true that many famous yakiniku restaurants in Japan are run by Koreans. There’s no doubt that they contributed significantly to the development of yakiniku culture in Japan. Don’t forget, though: yakiniku is ultimately “do it yourself” cooking. Even if you go to a restaurant, there’s not a chef who cooks for you. You cook for yourself; the restaurant simply supplies you with the ingredients and the grill. When you’re at a yakiniku restaurant, part of the true experience includes drinking beer and enjoying the company of family or friends. In other words, it’s very likely you won’t be concentrating just on cooking process as a chef might. So naturally, you shouldn’t expect that everything will be cooked just right: some of the meat will surely be cooked too much and some will just be burnt. It’s all part of the experience. If you must eat meat that has been prepared to perfection, maybe yakiniku is not the best choice for you. Yakiniku is about partying, playing with fire, and trying lots of different things. When all is said and done, nobody really cares if it’s Korean or Japanese; it’s all about an evening spent with friends wolfing down a DIY feast! 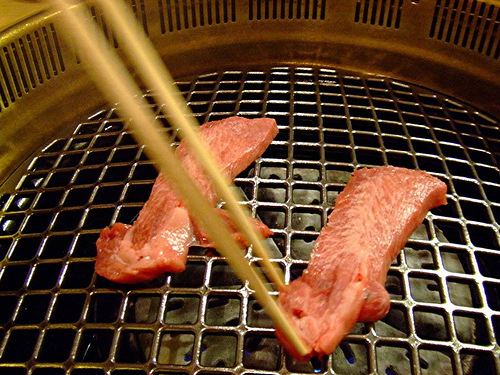 Editor’s Note: If you’ve tried yakiniku, what’s your favorite style of meat to barbecue? Share your grilling tips and tricks in the comments! Kanako Noda started helping her mom make dinner in Shiga, Japan, at the age of four. An artist based in Montréal by day, she evangelizes on the Japanese way of eating by night. "There's a fantastic, dazzling variety of Japanese dishes that Americans keep missing," she says, "because they can't see past the thick undergrowth of sushi bars everywhere." Kanako believes in real food made by real people using real ingredients, and is allergic to food gimmicks, straight-from-the-lab ingredients and diet fads of all kinds. Most of all, she's into introducing Westerners to Japanese common sense on what you should eat, when, how much, how and with whom. Her Japanese home cooking recipe blog is at KanakosKitchen.com.